Using novaPDF Lite you can easily create high quality searchable PDF files in an affordable and reliable way from any Windows application. It installs as a printer driver and helps you generate the PDF files by simply selecting the "print" command from any application (you can convert your Word documents, Excel sheets, PowerPoint presentations, AutoCad drawings, company’s reports, contracts, workflows, agreements, marketing plans, forms, products list, price list, charts, emails or web pages). Its purpose is to enable users to easily exchange electronic documents, independently of the application in which they were initially created. The resulted PDF files can be viewed on any computer with a PDF viewer (reader) installed. This PDF printer driver is compatible with Windows 7/2000/XP/2003 Server/Vista (32-bit and 64-bit) and requires approximately 10MB of free disk space for the installation. It doesn’t require third party tools to be installed in order to generate the pdf file (like Adobe Acrobat or GhostScript). 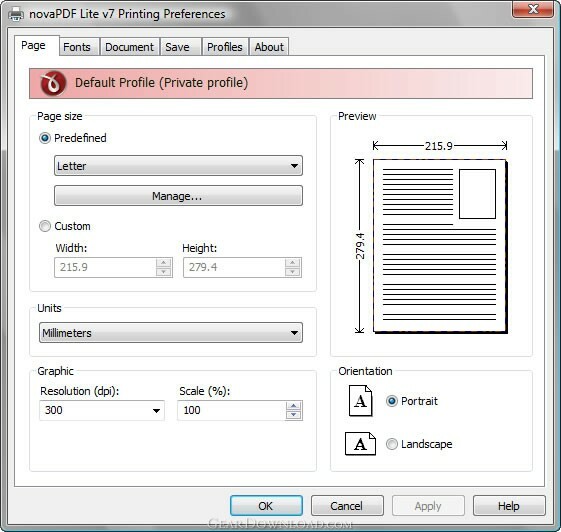 novaPDF can append/insert content to an existing PDF file. This download (novapl.exe) was tested thoroughly and was found 100% clean. Click "Report Spyware" link on the top if you found this software contains any form of malware, including but not limited to: spyware, viruses, trojans and backdoors. novaPDF Std 7.6.381 - novaPDF Std allows you to easily create PDF files from any printable document. novaPDF Professional Server 7.6.381 - novaPDF Pro Server allows you to create PDF files from any printable document.